Saudi Arabian stocks declined to the lowest in two months on investor concern that a proposed land tax may lower profit at banks and real estate companies. Israeli shares rose. 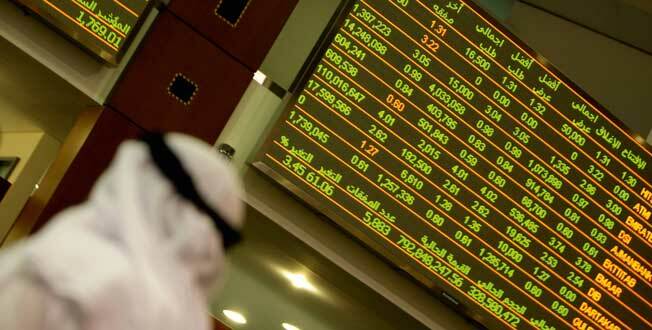 The Tadawul All Share Index fell 1.4 percent to close at 7,276.26. Al Rajhi Bank, which has the heaviest weighting on the gauge, was the biggest contributor to losses after it retreated 2.3 percent to the lowest in more than seven weeks. Israel’s TA-25 Index advanced 2.3 percent, the most in two months. The DFM General Index climbed 0.3 percent. The Saudi government plans a tax on white land, or plots that remain undeveloped for years, to help tackle a housing shortage. While the measure will boost government revenue, it will impact banks that use these plots as collateral for loans. The proposed fine comes at a time when the slump in the price of oil, the kingdom’s biggest source of revenue, led to a drop in deposits and a rise in borrowing costs. “The structural reforms in Saudi real estate are the reason for the declines in the market today,” said Mazen Al-Sudairi, the Riyadh-based head of sell-side research at Alistithmar Capital, a unit of Saudi Investment Bank. The market “is trying to make some discounts regarding real estate and that is affecting the banking sector,” he said. Stocks in Abu Dhabi, home to almost 6 percent of the world’s proven oil reserves, also fell after banking shares declined. An almost 45 percent drop in Brent crude prices in the past 12 months has hurt profit in Gulf nations, which rely on income from oil to fund public spending. The ADX General Index lost 0.3 percent. Union National Bank PJSC’s third-quarter net missed analyst estimates by more than 10 percent. The lender’s stock led the index’s decline with a 3.8 percent retreat, the steepest in two months. Stocks in other parts of the Arab world benefited from a renewed appetite for riskier assets after central banks in Europe and China took measures to shore up the global economy. Egypt’s EGX 30 Index rose 0.6 percent, and Qatar’s QE Index, and Kuwait’s stock gauge advanced 0.5 percent each. Oman’s MSM 30 Index gained 0.3 percent. Equities worldwide rose last week after China’s central bank cut interest rates and European Central Bank President Mario Draghi signaled that he will bolster stimulus if needed amid signs of slowing global growth and tepid inflation. Investors are betting that central banks worldwide, including the U.S. Federal Reserve, will continue to support low-rate environments. The Standard & Poor’s 500 Index and the MSCI Emerging Market Index both rose the fourth consecutive week on Friday. Israel’s TA-25 Index advanced 2.3 percent to 1,580.33, led by Teva Pharmaceutical Industries Ltd.’s 5.9 percent jump, the most in almost three months. The equity gauge was near the upper Bollinger band, a bullish indicator for some technical analysts. Teva’s American deposit receipts rose 6.4 percent on Friday after the company said it launched a $22.5 billion bridge loan for its acquisition of Allergan Plc. The stock fell 3.4 percent a day earlier. Israel’s oil and gas explorers climbed to the highest in almost two months on bets the nation’s natural gas policy will be approved after a cabinet reshuffle by Prime Minister Benjamin Netanyahu. Nearly a year of wrangling has delayed development of Leviathan, Israel’s largest offshore field, in which U.S.-based Noble Energy Inc. and Israel’s Delek Group Ltd. hold stakes. The TA-Oil & Gas index gained 1.8 percent to the highest since Aug. 30. Delek Group shares rose 3.8 percent to 986.60 shekels.